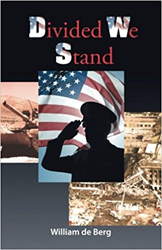 The drug scourge in America, the international operations that support the drug trade, the recent Jade Helm exercises, revelations concerning the tension between certain sectors of the military and the deep state and the latter's efforts to silence the alternative media has inspired William de Berg to write “Divided We Stand” (published by Trafford Publishing), his third book of conspiracy fiction. The book tells the story of Enrique Ybarra, a famous young general who suffers the loss of his two brothers—one in a drug overdose and the other in an effort to expose the CIA-linked drug trade. Already reeling in his personal life and marriage, Ybarra is introduced to a team of high-ranking military officers who convince him that there will soon be a crisis in the republic involving martial law and that he needs to join them. The three senior officers grew quiet, and Cummings and Taylor looked down, with Cummings fidgeting slightly. Then Dennison, in a soft and deliberate voice, asked Enrique, “Do you know who died in the Pentagon that day, Kiki?” When Enrique didn’t respond, Dennison said with his voice rising a bit, “Soldiers and sailors died that day, Kiki. Fifty-five in all, plus a bunch of military contractors. American soldiers and sailors! Soldiers and sailors who never got the truth of their sacrifice in a court of law!" With "Divided We Stand" and his two previous works "Serpent and Savior" and "White Spiritual Boy," William de Berg has established himself as the master of conspiracy fiction. Trafford Publishing, an Author Solutions, LLC, author services imprint, was the first publisher in the world to offer an “on-demand publishing service,” and has led the independent publishing revolution since its establishment in 1995. Trafford was also one of the earliest publishers to utilize the Internet for selling books. More than 10,000 authors from over 120 countries have utilized Trafford’s experience for self publishing their books. For more information about Trafford Publishing, or to publish your book today, call 1-888-232-4444 or visit trafford.com.